If laying your head down on an inflated plastic bag placed on top of your laptop is your idea of comfort… My God. 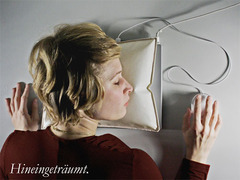 Anyway, if you do find yourself yearning for such an accessory, you now purchase a professionally made one: the iSleep USB pillow – specially honed for powernaps. It plugs into a USB port on your laptop and auto-inflates when you shut your laptop, deflating when you open your laptop again. I suppose the advantage is that you don’t have to move to snooze. “It is almost midnight, the eyes get heavier and our “to do” list waits with several prettily marked points of work, which have to be done until 8:00 o’clock in the morning. Yes, sleep is luxury and our working place “NO SLEEP” area. Tell me about darling, the slamming on the desk, the Club Mate… my head does hurt. Alternatively go have a hot bath while eating chocolate ice-cream, truffles watching Friends and drinking – you won’t get any work done, but you will learn the true meaning of comfort. The iSleep USB pillow is actually a university project, so not commercially available, but do see digital.ukd for more information. Have you checked out the blog Little Moth? Maybe we should submit our little jewel boxes to her.